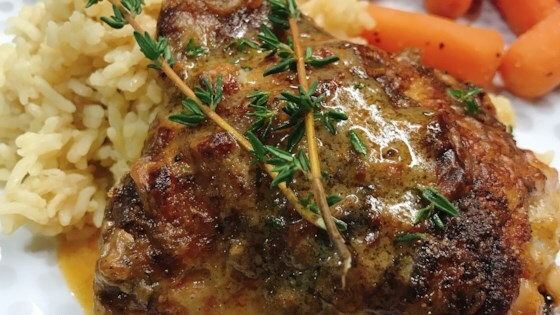 "Tender dark-meat chicken thighs and drumsticks baked in a rich, creamy white sauce." Place chicken in a large bowl and coat generously with salt, pepper, and paprika. Heat butter in a large skillet over medium heat. Add chicken to the skillet in batches, skin-side down. Cook until skin is golden and crispy, about 2 minutes per batch. Remove chicken and place into a large baking dish. Add thyme and garlic to the skillet. Cook over medium heat until garlic is fragrant and lightly browned, about 1 minute. Whisk in flour slowly into a thick paste. Add wine, stock, lemon juice, and cream and bring to a simmer, about 5 minutes. Add Parmesan cheese and stir until melted. Pour sauce over chicken in the baking dish. Bake in the preheated oven, uncovered, until chicken is not longer pink inside and juices run clear, about 30 minutes. I had a little cream to use up and this was on my feed that day. Good flavor but very greasy. I’ll remove the skin next time. This will be my go to for a crowd pleaser from now on. Only substitution was I used chicken breasts. This was really good. I read the other reviews and I think it could have more lemon in it. Hubs loved it. Tried this recipe and it was so delicious. Great flavor and easy to make. We will definitely have these chicken thighs again!